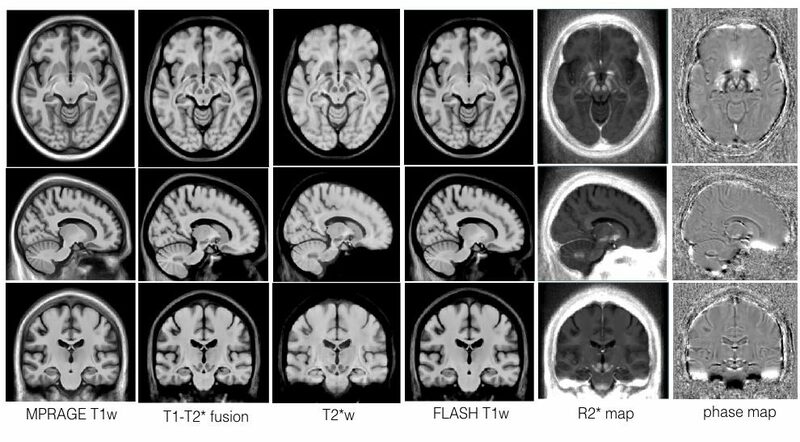 This set of multi-contrast population-averaged PD brain atlas contains 5 different image contrasts: T1w ( FLASH & MPRAGE), T2*w, T1–T2* fusion, phase, and an R2* map. Probabilistic tissue maps of whiter matter, grey matter, and cerebrospinal fluid are provided for the atlas. We also manually segmented eight subcortical structures: caudate nucleus, putamen, globus pallidus internus and externus (GPi & GPe), thalamus, STN, substantia nigra (SN), and the red nucleus (RN). Lastly, a co-registered histology-derived digitized atlas containing 123 anatomical structures is included. 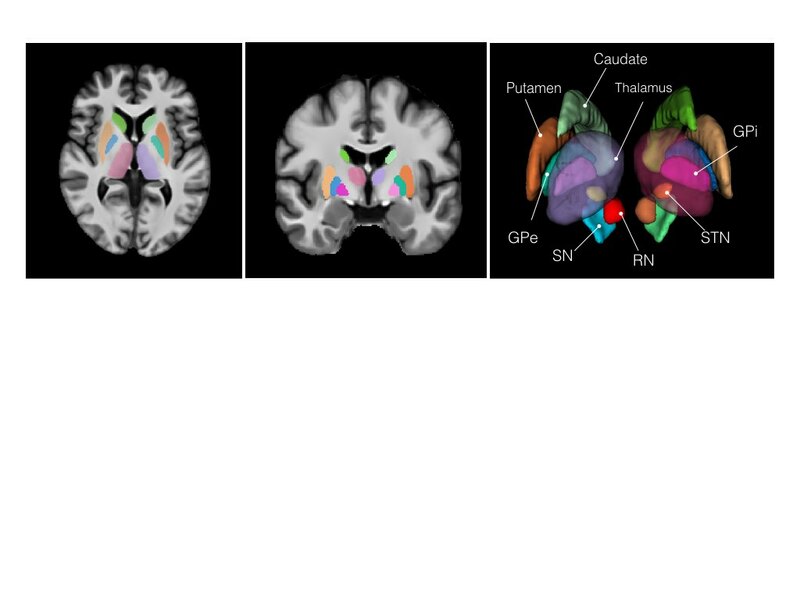 We employed a novel T1–T2* fusion MRI that visualizes both cortical and subcortical structures to drive groupwise registration to create co-registered multi-contrast unbiased templates from 25 PD patients that later went for the STN deep brain stimulation procedure. The finished atlas is in ICBM152 space. Three different resolutions are provided: 1×1×1 mm, 0.5×0.5×0.5 mm, and sectional 0.3×0.3×0.3 mm. 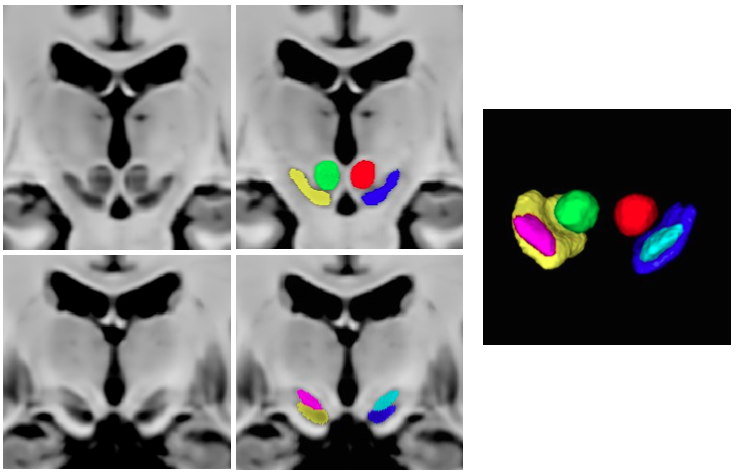 To help bridge the insights of micro and macro-levels of the brain, the Big Brain atlas was nonlinearly registered to the PD25 and ICBM152 (symmetric and asymmetric) atlases in a multi-contrast registration strategy, and subcortical structures were manually segmented for BigBrain, PD25 , and ICBM152 atlases. To help relate PD25 atlas to clinical T2w MRI, a synthetic T2w PD25 atlas was also created. The registered BigBrain atlases are available at the resolutions of 1×1×1 mm, 0.5×0.5×0.5 mm, and 0.3×0.3×0.3 mm. Y. Xiao, J.C. Lau, T. Anderson, J. DeKraker, D. Louis Collins, T. Peters, and A.R. Khan, “Bridging micro and macro: accurate registration of the BigBrain dataset with the MNI PD25 and ICBM152 atlases,” bioRxiv 561118; doi: https://doi.org/10.1101/561118. 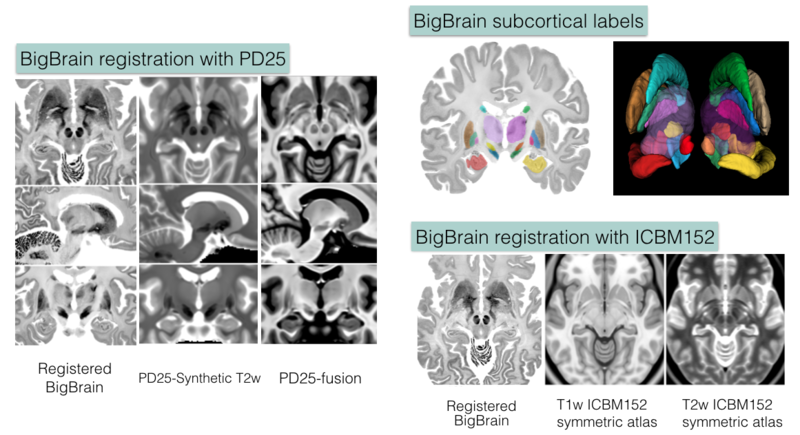 Dataset for BigBrain co-registration with PD25 and ICBM152 is under CC BY 4.0 Licence. Note that this exception to the existing BigBrain dataset does not alter the general term of the license for the use of BigBrain itself, which is still under CC BY-NC-SA 4.0 License.